Two days ago I attempted Pad Thai. I overcooked the noodles, used too much sauce and – in an attempt to appease my non-Bok-Choy-loving husband – I roasted the Bok Choy. I roasted it because roasting transforms vegetables from mundane to OUTSTANDING. The carmelization, the sweetness, the crunchiness – it all just brings regular vegetables to a whole new level. Good Lord that sounds pretentious. I just really really like roasted veg. They make me happy. Anyway, Bok Choy roasted…. Um…. Let’s just say that….well, I’ll be eating this all by myself as leftovers this week. I even think I bought the wrong noodles. Craptastic. Even the peanuts look wrong somehow…. 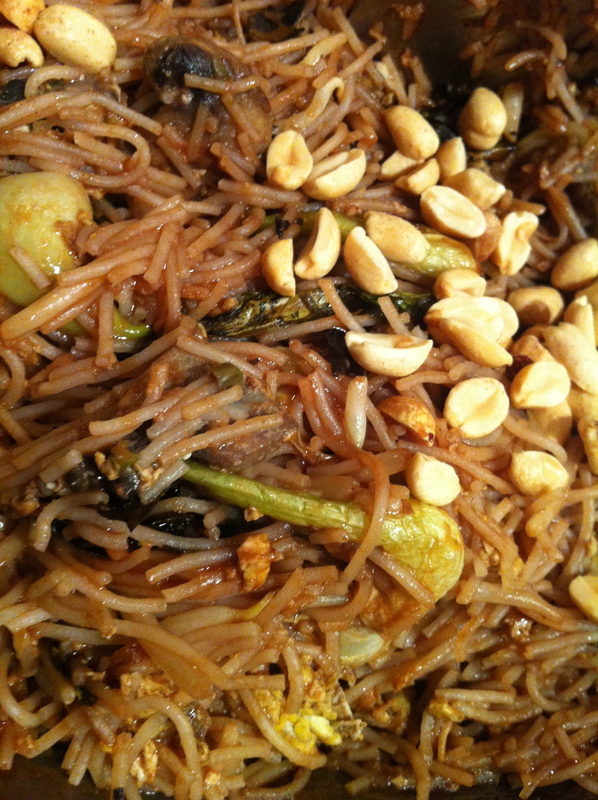 PAD THAI SAUCE: (if not using bottled sauce….you should use fresh sauce. It’s better). 1- Bring a pot of water to a boil and remove from heat. Soak noodles in the hot water for 15 to 20 minutes. Drain and rinse with cold water. 2- Dissolve tamarind paste in the hot water. Add the other pad thai sauce ingredients and stir to dissolve the sugar. Add as much or as little chili sauce as you prefer, but don’t skimp on the sugar (you need it to balance the sourness of the tamarind). Set aside. 3- Place your wok over medium-high heat. Add a tablespoon of oil plus the garlic and onions. Stir fry for about a minute to release the fragrance. Add the bok choy plus the two tablespoons water. Stir-fry 2 minutes, or until bok choy is bright green and slightly softened. 4- Push ingredients to the side of the wok and add a tablespoon more oil to the center of the wok/pan. Add the eggs and stir-fry briefly to scramble them. If using soft tofu instead of egg: Add it when you add the noodles. It will break up into small bits and be distributed throughout the dish, just as egg would. 5- Push eggs aside and add a little more oil to the middle of the wok/pan. Now add the drained noodles and 1/3 of the sauce. Stir-fry everything together for 1 minute using 2 ladles and a tossing motion (like tossing a salad). 6- Add a little more sauce and continue stir-frying in the same way for 1-2 more minutes, or until the noodles begin to soften and become sticky. Reduce heat to medium if they begin to stick and burn. 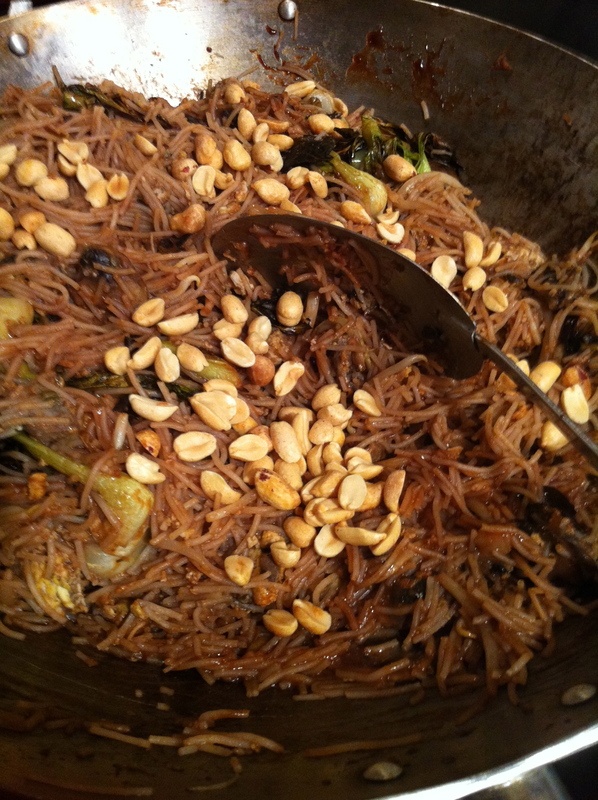 7- Add the bean sprouts plus the remaining sauce. Stir-fry to incorporate everything together for 1-3 more minutes, or until noodles are done. Noodles are cooked to perfection when they are soft but still deliciously chewy and a little bit sticky. Remove from heat and taste-test, adding more pad thai sauce or soy sauce or chill sauce if desired for more salt or flavor. Roasted Chicken with Cauliflower, Red Onion, Tomatoes and Chickpeas a la Martha Stewart. Except I was outta Chickpeas, so I subbed in Small White Beans instead. Good substitute, not great. I had a looooong day yesterday and when it got to 4p and I hadn’t even thought about making dinner yet, I stuck my head in the fridge and made C choose between chicken and cauliflower or chicken and capers for dinner. Since he didn’t care, I went with the easier one. The Roasted chicken is DEAD EASY. You buy a chicken already cut into 8 pieces (or knock yourself out with the knife and the carving board). You whack a pan in the oven and preheat to 450. When it’s hot, you lay out the chicken – skin side up – and shove it in the hot oven (top rack) for 20 minutes. Either you take this 20 min to prep your veg (cut off the nasty bits of the cauliflower, open & rinse your can o’ beans, wash your tomatoes, quarter your red onion) OR you can do as I did and sit on the couch and play games on your phone for 10 minutes, then get up and prep the veg. Either way – you pull out the hot pan at the 20 min mark, transfer the hot chicken to a different pan and shove the chicken back in the oven (top rack). Then you toss the veg in the chicken schmaltz (chicken fat) on the old pan (the hot one). If need be, add a bit of olive oil til everything looks glossy and coated. Toss that into the oven (middle rack) and go play more video games for 30 minutes. Alternatively you can help your children as they dismantle the bookcase/throw things/scream and run around the house. Option 3 is to set the table. It doesn’t look nearly as good as it tastes. It *rocks*. I served it with fresh bread and a salad. 1- Place a rimmed baking sheet in oven and preheat to 450 degrees, with racks in upper and middle thirds. Season chicken with salt and pepper. Carefully remove sheet from oven and arrange chicken, skin side up, in a single layer. Roast on upper rack, 20 minutes. 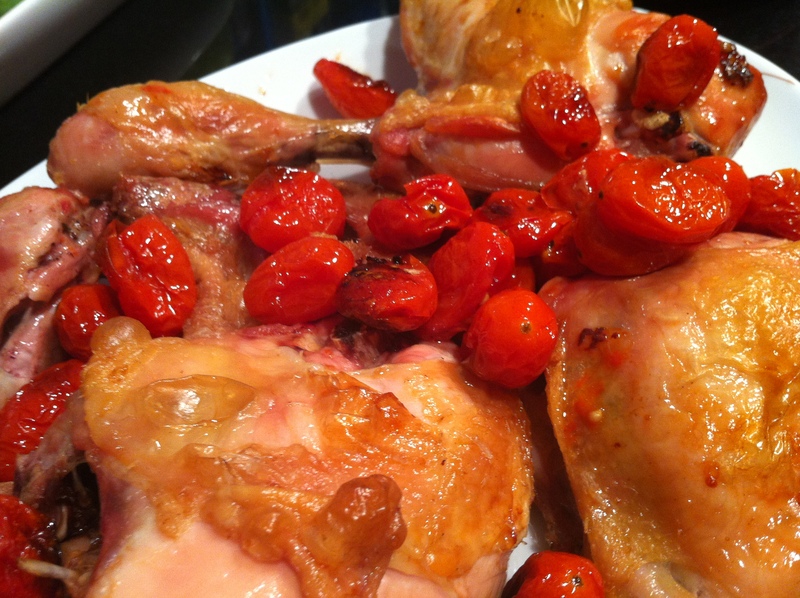 2- Remove chicken from oven and, with tongs, transfer to another rimmed baking sheet along with tomatoes. 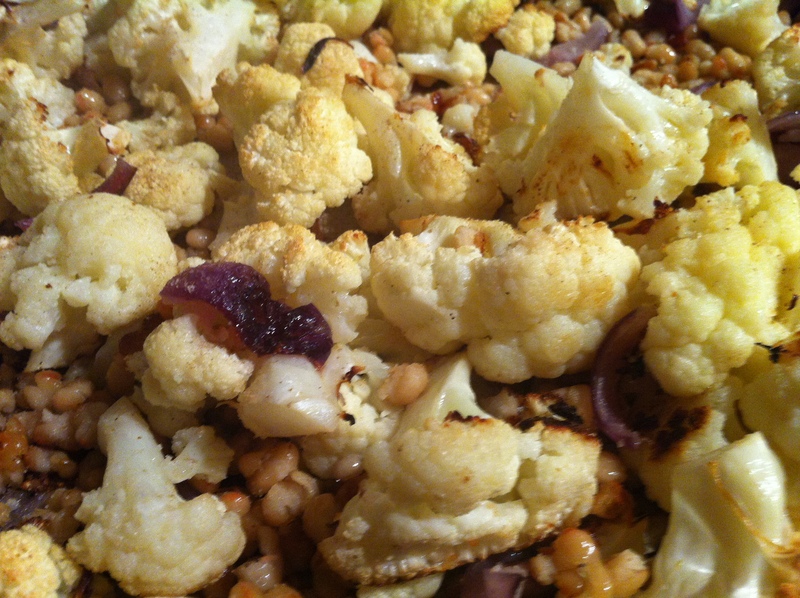 Add cauliflower, onion, and chickpeas to drippings on first sheet and toss to combine; season with salt and pepper. Roast chicken on upper rack and vegetables on middle rack until chicken is golden and cooked through and cauliflower is tender when pierced with a knife, about 30 minutes. Transfer chicken and vegetables to a serving dish and serve immediately. This recipe is seriously easy and VERY impressive to serve at a dinner party (which I’ve done twice now). It impresses the pants off of people if you serve the whole mess over homemade pasta. …Just sayin’. Tried the chicken (used sliced tomatoes and broccoli and white onions, but otherwise…) Chicken was great! Moist and cooked through. Never cooked it at 450 before. Will again. Your pad thai might not have worked out but the chicken and cauliflower looks great!